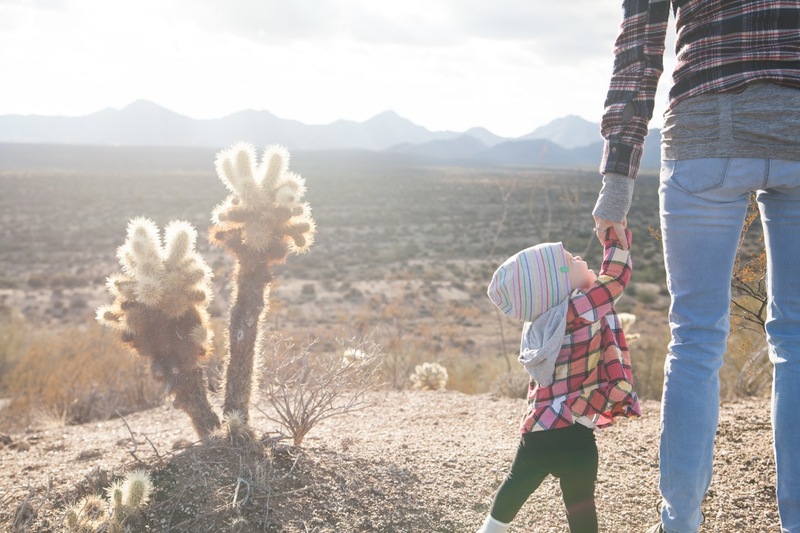 Equipped with those criteria, we've put together our picks for the 16 best hikes around Tucson, Arizona for kids. Each hike on this list is not too long or treacherous, is full of diversity, and has cool places that kids will want go to. There is a range of levels among these hikes because we wanted to account for half-pint hikers between the ages of 4 and 12. In the second post of our 5 part series on Hiking with Kids, we noted that under our system, level 1 hikes are about right for the under 5 crowd, level 2 hikes can be good for 5-7 year olds, and anything 3 or higher are usually best reserved for kids who've hit their 8th birthday. If in doubt, it's always better to underestimate with a lower level hike than to get them in over their heads on a higher level hike than they are prepared for. We hope you'll find some new favorites for your family. The out-and-back hike to the old dam in the middle of the Santa Catalina Mountains has a few things that will appeal to young hikers. First, if you time it right, there can a surprising amount of water on both sides of the saddle that sits about halfway to the dam after a good rain or snow. The approach to the saddle is a sandy creek bed and the silted in reservoir above the dam can be a fun place to play in the water beneath the shade of the trees. Then there's the dam itself, which was built to provide water to the Gordon Hirabayashi Prison Camp where the hike began and can be a fun picnic location. Finally, the hike is dog friendly as well as kid friendly, so your children are able to bring their four legged companions on this one. 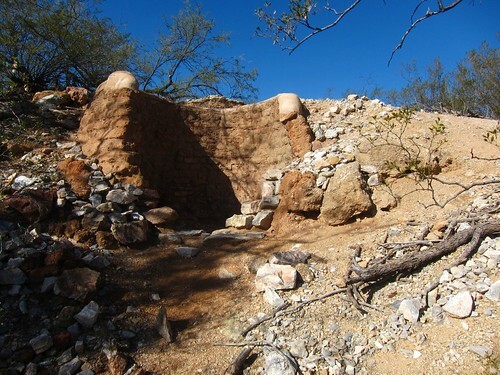 Out in Saguaro National Park East, the nice and easy hike to some lime kiln ruins is a great easy hike that can be used as inspiration for a little history lesson and maybe even a craft project. The hike itself is mostly flat and pretty straight forward, so you don't have to worry about your children getting lost or injured. But the namesake destination itself was used for a 40 year period, starting back in the 1880's, to convert stone that was quarried from the local hills into lime. The final powder product was used to make mortar, as a waterproof wash for the outside of walls and buildings, and for removing hair from animal hides to make leather. If you happen to go after a good rain or snow, you might also want to check out the nearby falls to see if they're flowing. Sitting in the saddle of the main peak and one of its smaller children to the North is a little spot that affords some amazing views without the rigorous climb of the area's most popular trail. Picacho Overlook earns a spot on this list not only because it's a relatively easy trail with great views, but also because of what it's nearby. One child sized attraction can be reached by simply walking past your vehicle as you get to the trailhead. A short walk down the trail out of the other side of the parking lot is the Children's Cave, a hole in a rocky hill that acts like something of a built in chimney for the mound. The other area attraction is Rooster Cogburn's Ostrich Ranch, where you can let the kids feed some animals, ride a monster truck, and of course see some ostriches. 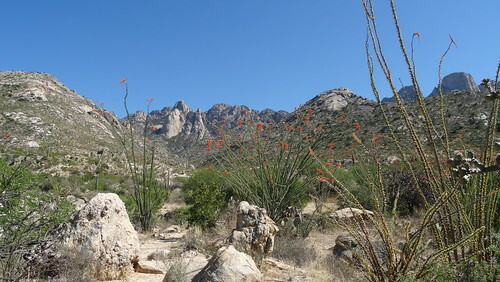 The first of three hikes in Catalina State Park on this list, Romero Canyon Loop is a nice flat stroll through the desert grasslands on a wide sandy path. So why is it on this list? The trail crosses over the Cañada del Oro wash early on, and since this hike is a lot more enjoyable when there's water, you'll know really quickly what you're in for. After crossing over the wash, the trail passes by the first of two benches, both perched at the edge of the plateau where you'll do most of the loop. After you spot the second bench, you'll know it's time to descend back down to the riverbed. If there's been a decent rain or snow, it's worth taking a small adventure to the right when you reach the bottom as the "Hidden Pool" is not far away. Assuming the water is flowing, wading through the sandy stream barefoot can be a fun and refreshing way for your kids to get back to the trailhead. Another Catalina State Park that is great for children, Bathtub Tank is a lesser known loop that heads out on top of plateau, winds back through the bottom of a small valley, and offers a seasonal pool in the middle. Getting the timing right to find water in the tank can be tricky, but doing this hike soon after a good storm is your best bet to enjoy the clawfoot shaped tank just below the trail at the halfway point. Not only can you relax in the tub, but there's a small sandy area below where you can get a small shower from the overflowing water as well. The Tucson Mountains to the West of town are fully of treasures to explore. 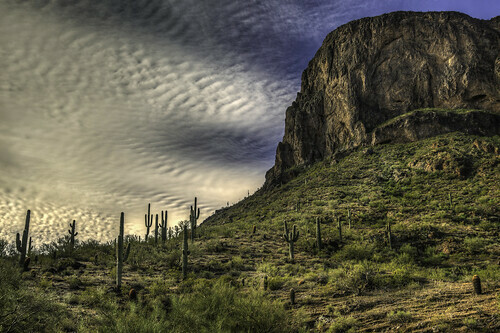 Gates Pass is the best place to watch the Sunset in the Old Pueblo and Wasson Peak offers one of the best 360 degree views around, but finding a hike out there that will appeal to children can be tricky. 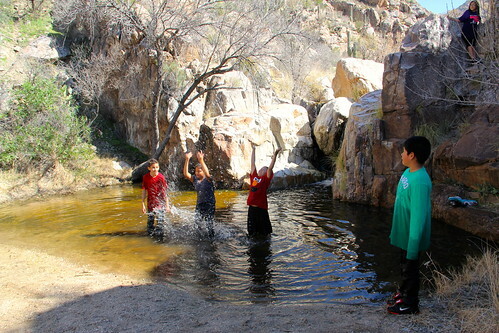 Our favorite hike in the Tucson Mountains for kids is the Gould Mine Loop. Not only does it take you past an old copper mine, where the hillside is still covered in orange tailings, but there is also ample opportunity to explore the sandy wash for ancient petroglyphs. Mam-A-Gah Picnic Area sits right in the middle of the hike, which can make for an excellent place to break out the snacks beneath the covered ramada. If being out in the desert has piqued their curiosity about the environment, you can take them right across the street afterwards to learn more at the Arizona-Sonora Desert Museum. What could be better than a shady hike in the mountains among the pine trees that goes through patches of ferns, over a spring fed stream, and out to a stunning vista? If you're struggling to come up with an answer, Box Camp is the hike for you. This pleasant hike up near the top of Mount Lemmon is an excellent one to do with youngsters since there's tons of variety to keep their interest and there aren't any treacherous areas where you have to be super cautious. Because of the changing scenery and relatively easy terrain of this trail, it is the only level 3 hike on this list. There is one thing that you may want to consider ahead time though; since this hike starts at the top of the mountain and goes down, the uphill climb is on the second half of the hike, so be sure to save some energy for the way back. The final hike on our list from Catalina State Park, the hike to Montrose Pools shares much of the same trail as Romero Canyon Loop higher up. So why did this hike deserve the top spot among CSP options? Even though we generally recommend loop hikes for kids, this out-and-back hike goes out to sandy pool that provides an ideal place for kids to splash and play. As with all desert hikes, water is never guaranteed, but it's an amazing little spot when present. Since the path to Montrose Pools is just a short spur trail off of the Romero Canyon Loop, you could easily build your own hike that does the loop with a short stop over at the pools instead of the standard out-and-back. 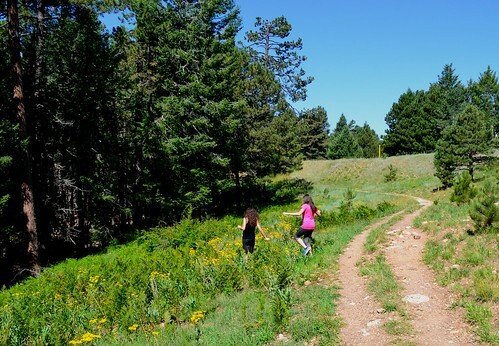 Up at the very top of Mount Lemmon is a magical little loop hike that passes through old growth forest, new growth areas recovering from the 2003 fire, and meadows full of grasses and wildflowers. At less than two and a half miles total, there isn't much more you could ask for when looking for a child friendly hike in the mountains. 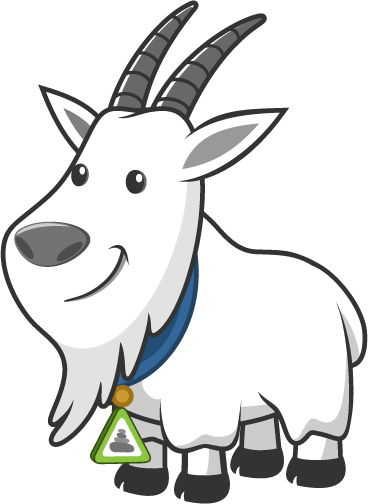 There's even an active fire lookout station along the trail and although it's off limits when the spotter is on duty, they have been known to take the opportunity to show the occasional young guest around. After all, sparking curiosity and wonder in the mind of a child can be a great recruiting tool for the next generation of forest rangers. It's a loop hike with an optional out-and-back detour under a bridge and up a sandy wash. There are petroglyphs etched into the canyon walls that are more than a thousand years old. The mouth of a narrow section of the canyon is blocked by an old stone dam that used to provide water for sheep herds in the area at the turn of the 20th century. It's not every day that parents have the time to drive all of the way up the Catalina Highway, so hikes like Honey Bee Canyon are a great way to make some fun memories on the trail with your children without taking up the entire day. Between Box Camp and the Meadow Loop, we've already pointed out two of the best high elevation hikes around Tucson for kids. But this list wouldn't be complete without Aspen Loop. Beginning in the Marshall Gulch picnic area, which is a magical place to have a snack before or after the hike, we suggest doing the loop clockwise, heading up the trail past the gigantic trees to the South. In that direction, you'll quickly come upon a green tunnel of aspen trees, followed by patches of ferns on the hillside and eventually the spur trail out to the vista. Eventually, you'll reach the 5 point junction where you'll take a sharp right to enjoy a beautiful downhill stroll along a mountain stream all of the way back to the picnic area. At a little over 4 miles, this may be a bit long for younger kids to do all by themselves, but there's plenty of interesting scenery to keep the attention of those who can make it. If you use our Find a Hike tool to filter out all level 1 or 2 hikes in the Tucson area, you'll probably notice that we've left a few off of this list. Likewise, locals answering this question may give a few suggestions that we've also omitted. Raising children is a serious responsibility and we try to equip hikers to make sound decisions when heading out onto the trail, especially with little ones in tow. Yes, Tanque Verde Falls and Milagrosa Pools are both short, level 1 hikes to awesome destinations, but they're also very dangerous places. Dozens of people have died at Tanque Verde Falls due to flash flooding and we didn't feel it would be wise to recommend such places for children. 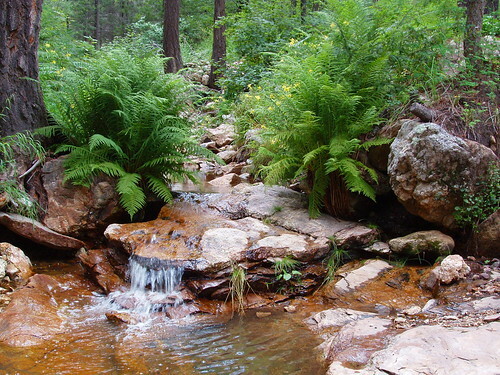 We also considered including Romero Pools, Pontatoc Ridge, and Maiden Pools, since they're all popular hikes for locals and their children, but they too have their own elements of danger. Since they're all level 3 hikes though, which are best reserved for older children and pre-teens, we thought it would be best to keep this list focused on the best options for kids aged 7 and under. 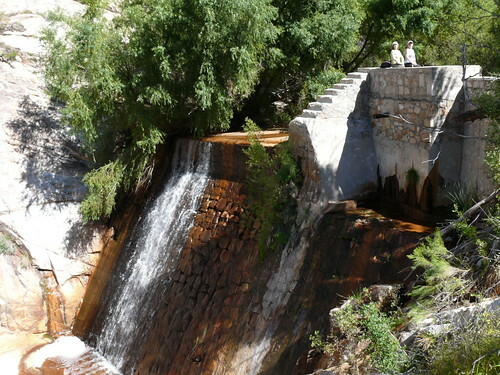 After the original plans to create a reservoir in the heart of the Santa Catalina Mountains fell through due to lack of funding during the Great Depression, plans were scaled back drastically and the result was the Sabino Canyon Dam. The stone dam is about 10 feet tall and once created a large recreational reservoir for locals to swim and fish in. The resulting lake has long since silted in, but the spot remains a popular playground for Tucsonans and their children. The ideal hike to the dam takes up along the Sabino Canyon road, where you can take a tram ride all of the way up into the canyon before or after your hike, before you veer off to the right onto a rocky trail. The pathway winds above Sabino Creek, which has flowing water year round, and eventually takes you past several concrete picnic tables in the shady riparian area above the dam. There is plenty of space for kids to run around among the bamboo and the sandy riverbed above the dam, and there are several natural water slides to entertain them below. Many families spend all day at the dam and once you've taken your crew, you'll understand why. 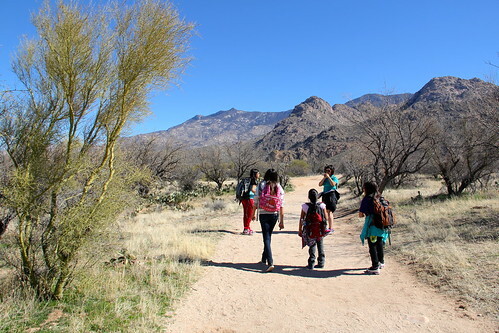 Now that you've seen our list of the best hikes for kids in the Tucson area, we want to see yours! What are your favorite places to take tiny hikers? Did we leave a hike off that deserves a spot? Tell us your thoughts about this post in the comments. The definition of an online therapy is multiple, so the interpretation is very broad according to several concepts. Here is a brief introduction to the analysis of the real options we have today online.